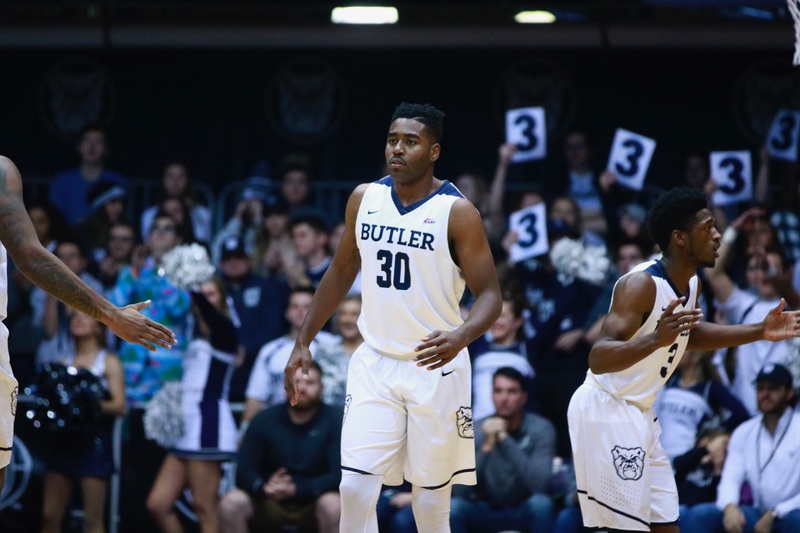 Kelan Martin steals a glance to the bench during a game at Hinkle Fieldhouse earlier this season. Martin scored 27 points against Georgetown, the second highest for the team. Collegian file photo. Butler pulled off a remarkable 91-89 win in double overtime, and in doing so sent many fans through a glass case of emotions. From thinking this was going to be an embarrassing 20+ point loss, to thinking there was a chance, to heart failure, overtime and double overtime, fans felt it all. Try not liking the Bulldogs. I dare you. #Butler basketball is so weird but I love every second of it. It’s damn near impossible not to like this team. But for some reason you just can’t stop. Start scheduling your doctor appointments along with Butler basketball. Georgetown 69, Butler 66. 3:39 to play. Just another night of the dawgs giving me a heart attack! Whats up w you? Overtime trumps ER heart attack visit. Bill Nye the Butler Bulldogs Guy! I am mailing all of my hospital bills to the attention of Butler Athletics. Might be harder than you think. Dear Butler I would like to watch one of you basketball games that doesn’t make me panic. Is that so hard? Better or worse than a heart attack? Dawgs will do that from time to time. Disclamer: Dawgs may take 20 years off your life. Hey this guy only lost 3 weeks. Give @LaVall_Jordan and @ButlerMBB the credit. Cost me 3 weeks off my life, but they got it done. You could say it was exciting. Triple OT on opening night? Who says no? Not sure why anyone would. Never, ever, ever, ever, ever, ever, ever, ever, ever, ever, ever, ever, ever, ever, ever, ever, ever, ever, ever, ever, ever, ever, ever, ever, ever, ever, ever, ever, ever, ever, ever, ever, ever, ever, ever, ever, ever, ever, ever, ever, ever, ever, ever, doubt the ‘Dawgs.